ECI - Expert Consultants Inc.
organizations in developing their technical edge. Career opportunities available! Call 240-379-7633 for more info. ECI’s team of talented engineers and programmers provide the highest caliber of service to build technology solutions that deliver results. ECI has earned a reputation of excellence from its customers and continues to serve in long standing relationships with clients in a variety of industries. ECI ‘s suite of software products were created by developers for developers. Challenges faced by ECI engineers and programmers everyday provide unique insights into the kinds of tools needed to simplify and address information technology differently. GUPI is a parsing tool that assists in processing, transforming, and managing structured and unstructured data across the enterprise. GUPI offers a centralized view of logic and real-time data viewers that allow developers to better understand and modify transformation actions for different types of input. Scripts can be developed to process and transform almost any type of protocol and easily modified to respond to new or changing protocols. The RAD IDE provides immediate feedback of rule changes. Data Views not only show feedback, but direct developers to the exact location of problematic rules. This reduces development cycles dramatically while increasing workflow efficiency. GUPI is an ideal solution for protocol analysis. There are literally thousands of protocols with formats that change constantly. It is difficult to keep up with this change and requires significant investments in software and technology. GUPI includes a knowledge base of rule templates so organizations can quickly customize or create new templates to intelligently transform information from documents, email, web sites, portals, legacy systems, and databases. Knowledge Management Web Application for creating, modifying, sharing, and viewing relational data. Epiphany provides a web framework for relational data management and link analysis. Users view data as link diagrams to visualize relationships and hierarchies between objects. Diagrams can be shared between users to maximize collaboration within an organization. 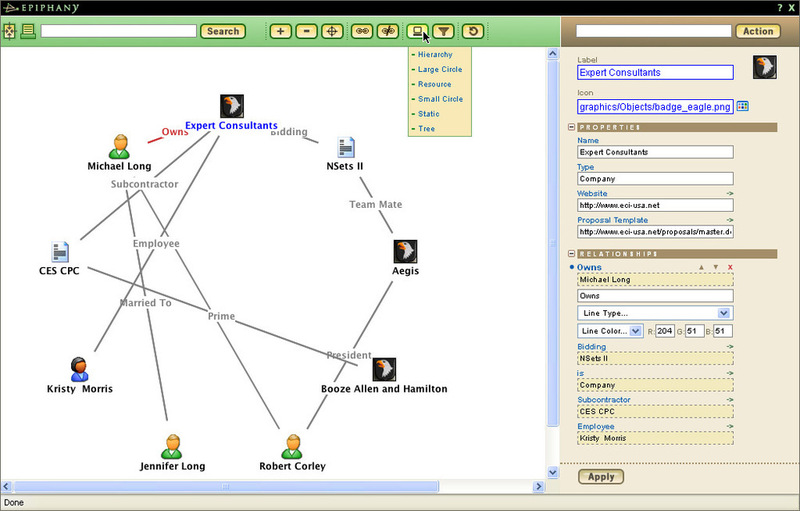 Epiphany can generate graph hierarchies, circle relation charts, tree charts, and data graphs from the data schema. Users can also create custom views of objects and their relationships. Data objects are represented as icons and contain relevant information specific to their type. Object properties and relationships are displayed in an attributes panel that enable users to view, update, or attach any related hyperlinks or documents that need to be stored with the object. Keyword searches can be performed on all data objects and formatted reports can also be generated. A single web server install provides easy access to any number of users without the need for dedicated client machines. Epiphany can also scale to multiple servers using a clustering database such as Oracle. FlexST is a platform independent software tool that enables users to view, build, and modify logic components to quickly develop and manage applications for multiple environments. FlexST’s simple point and click interface makes complex logic easier to navigate and build. Component layers can be opened and closed to reveal the underlying functionality as needed. FlexST uses an extended component architecture to ensure capability and expandability for the future. Built upon industry standards for component creation, FlexST allows integration of third party components seamlessly. New libraries are continually being added and updated to increase functionality or alter the role of the software as a tool. FlexST's intuitive interface allows non-programmers to build applications, web services, and user interfaces that can parse anything, manipulate XML, control databases, access email, control HTML forms, and control files. FlexST provides developer interfaces and is WebStart enabled so users can run the software from a web browser. FlexSt also allows users to test logic before deployment. This results in incredibly fast development cycles and confidence in one touch deployment with code generation. Gridflo provides a commanding point of view. It empowers users by allowing them to monitor, maintain, and manipulate distributed computing networks to achieve more efficient data processing power. Gridflo’s interface provides realtime view of loads based on enterprise, sites, site, machine, and applications. It runs on any Java enabled system and utilizes a standard XML API for ultimate flexibility. Gridflo uses an extended component architecture to ensure capability and expandability for the future. Built upon industry standards for component creation, Gridflo allows integration of third party components seamlessly. New libraries are continually being added and updated to increase functionality. Gridflo provides flexible distributed processing by hiearchial management of enterprise, sites, systems and applications throughout an organization regardless of platform. Gridflo's realtime graphical data processing meters allows users to track statistics, META data, and machine load. It allows multiple monitoring views and acts as a service registry.